S’mores Brownies - Home. Made. Interest. This easy recipe for S’mores Brownies is a delicious way to make s’mores without a campfire. 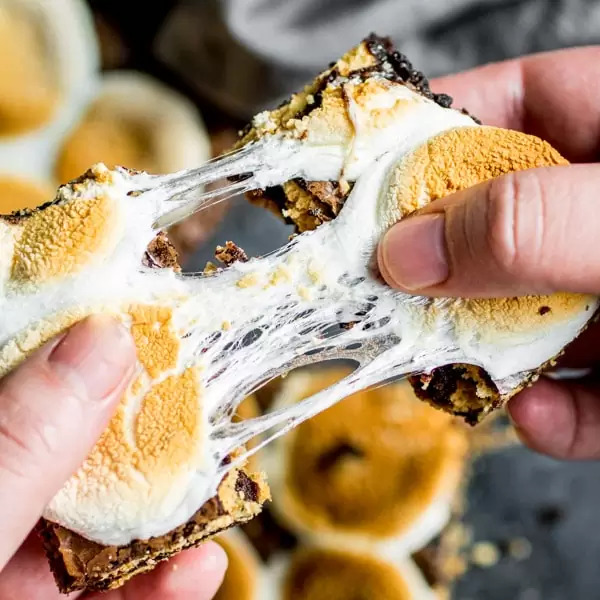 Layers of chocolate brownie, graham crackers, and toasted marshmallows makes these the ultimate s’mores dessert! 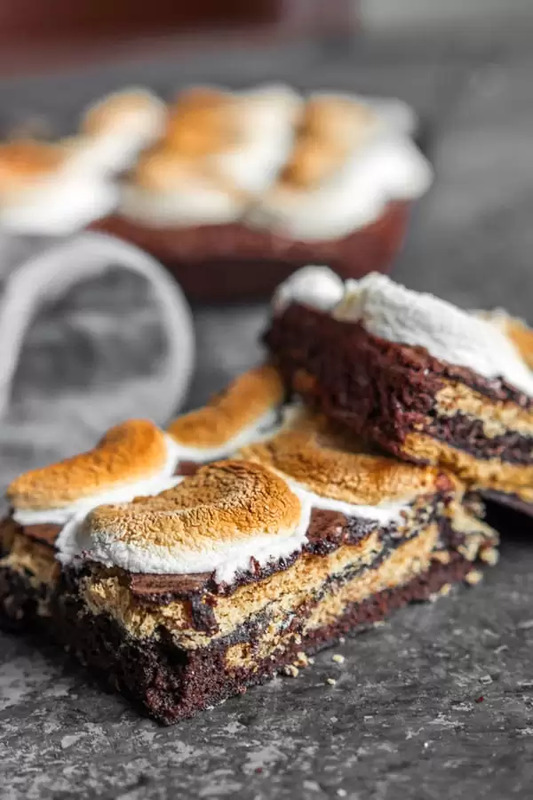 I LOVE s’mores and these S’mores Brownies are a simple way to get all of that chocolate-y, marshmallow-y, graham cracker goodness without having to sharpen stick and build a fire. S’mores brownies have all of the amazing s’mores flavors baked into delicious brownies. Perfectly toasted marshmallows without the need for an open flame :). In my opinion s’mores are the perfect dessert all year long but these S’mores Brownies are especially awesome for summer and fall parties, or a simple treat for family night. Note: This post may contain affiliate links. That means if you click on a link and make a purchase we may receive a small commission. Thank you! Mix up your brownie mix according to the box instructions. Place a layer of graham crackers on the bottom of a greased 9 x 13 inch pan (or whatever size pan your brownie mix calls for). Pour 1/2 of the brownie mix over the graham crackers. Add a second layer of graham crackers. 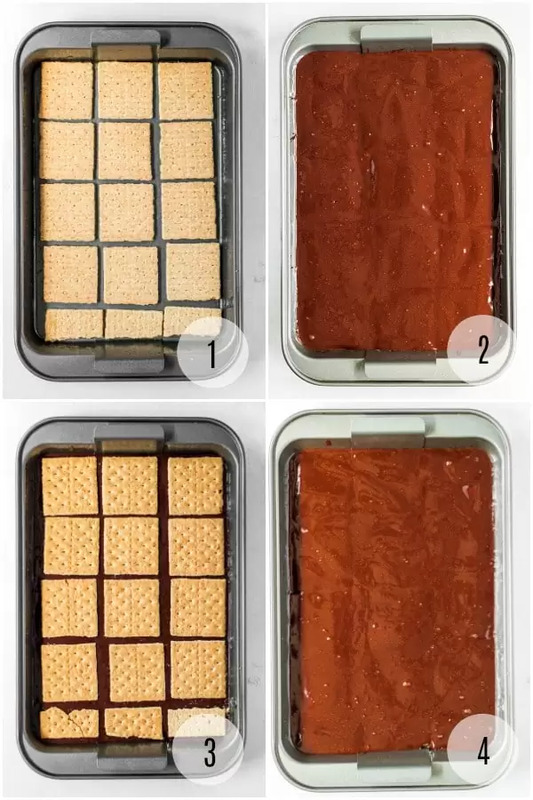 Pour the remaining brownie mix over the graham crackers. Bake brownies according to package instructions or until a toothpick inserted in the center comes out clean. Top brownies with a layer of marshmallows that have been cut in half and broil for 2-3 minutes until marshmallows are perfectly toasted. When the S’mores Brownies come out of the oven those marshmallows on top are all meted and perfectly toasted. You won’t be able to resist cutting into them right away! This is such an easy way to make s’mores for a crowd. 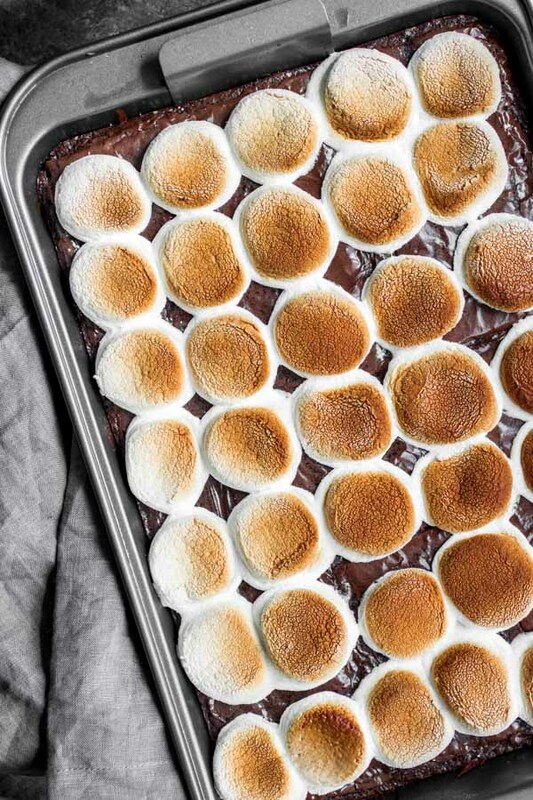 Smores’ and brownies are irresistable, put them together and you have the ultimate dessert! We took standard size marshmallows and cut them in half to make our top layer but you can use any size marshmallows you like. I love the graham cracker part of s’mores so I made two layers of graham crackers so you really get the flavor. Melinda likes a little less so she eliminates that second layer of graham cracker. It’s totally up to you! If you want to change it up a little you can also use chocolate graham crackers to make your S’mores Brownies! Like this recipe? Pin it to your Dessert board! S'mores brownie recipe that is a quick and easy way to make s'mores without the campfire and the mess. Lay 1 layer of graham crackers over the bottom of the dish. Lay another layer of graham crackers over the brownie mix. Bake according to brownie package instructions. Remove from oven and place the halved marshmallows over the top of the brownies. Place back in oven and BROIL for 2-3 minutes or until marshmallows are melted and brown. Remove from oven and enjoy! Note: We are not nutritionists. Nutritional information is generated using online databases. Use as a guide only. These look amazing!! I’m a huge smore’s fan, I pinned this! Thanks so much for sharing! Good gracious, these look fantastic!!! I don’t know what it is about s’mores, but sometimes, that craving strikes and it’s not that easy to go start a bonfire in your yard, ha! Thanks so much for linking up at Snickerdoodle Sunday- I hope you’ll come back with your latest makes next week! Check it out…check it out!! You will be featured at our party, Teach Me Tuesday, tonight as well!! This is an awesome recipe!! Just added to my must try folder great share!!! Yum!!! Thanks so much for sharing with Adorned From Above’s Link Party. We are featuring this post at this weeks Adorned From Above Link Party. This looks so sticky and ooey-gooey. I love chocolate so this is right up my aisle! Thanks for linking up in the Bloggers Brags Pinterest Party! Pinning to our group board. I’m always looking for clever ways to serve up a delicious dessert with little effort. I LOVE this s’mores recipe!! Kids absolutely loved it, and to quite my five year old…”This is the best thing you ever cooked, Mom!” Home run! Thank you for the idea, I will definitely make this again!! I mean this would truly satisfy my chocolate fix! Also Ooey and gooey! Gosh what could be better than Brownie and Smores! Please come join the party again today. Love to see what you’ve been up too! Great idea to make for the Grand kids. Looks absolutely delicious. Can’t wait to make this.